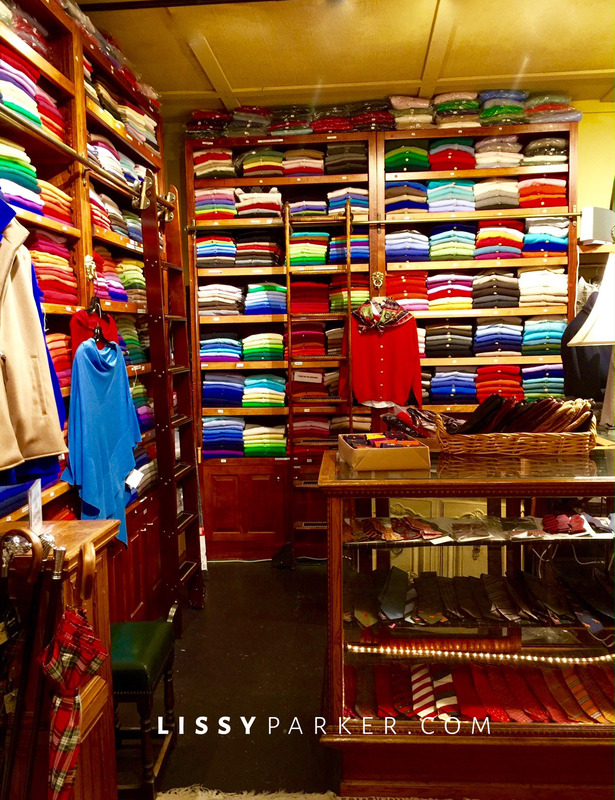 McCulley’s in Highlands, North Carolina is truly cashmere heaven this time of year. Shopping here is always an exhilarating experience. Around every corner is another wall of amazing color and pattern to choose from. They have every sweater you could imagine and the displays of scarves, gloves, hats and capes will make your heart beat just a little faster. Head on up ‘The Hill’ in Highlands and have a wonderful shopping experience today. If you can’t make it to Highlands just click on over to the McCulley’s website or give them a call and request anything you see here on the blog—they have more of the red leather and Stewart plaid gloves. Welcome to Highlands and Christmas shopping. The windows always tempt you inside. Need a little cashmere and fur trim to keep you toasty warm? Red and Black is always a great idea. These red leather and Stewart plaid gloves are calling my name. Every girl’s dream—a wall of light cashmere wraps. Burberry is always a good idea. So adding these caps and scarves to my Christmas list. They have gloves in every color and size—there are those red leather ones again. What a cute red rain coat and scarf for those rainy days. Turtlenecks in every color and size fill another wall. I would love this corner in my closet. Socks in every color and design fill the drawers. I love this aubergine and navy scarf. Ready to checkout! Now where are those gloves! A cashmere turtleneck sweater is my “go to” for winter, and I love the gray puffy jacket with the fur! Hope you have a wonderful Christmas, Lissy and so hope we get to meet in 2017!